I cut out and laminated these job description cards and put them in pockets with the job title on them. I also put popsicle sticks with students numbers in the pockets to show which student has which job. Students refer to these description cards often, especially after switching jobs. I use a class economy so the salaries for each job are also listed, but can be easily edited or removed. 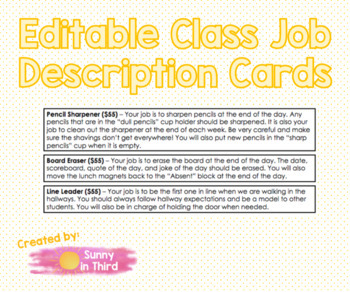 These are completely editable so you can customize descriptions for your own class jobs!